Plagues by dreams of madness, journey to Undermountain and join in the adventure of a lifetime! In the Waterdeep Dungeon of the Mad Mage board game, you play a heroic adventurer. With amazing abilities, spells, and magic weapons, you must delve into the depths of Undermountain, where you will contend with strange and dangerous creatures, avoid devious traps, and discover treasure. 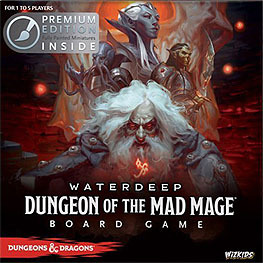 The Waterdeep Dungeon of the Mad Mage board game features classic dungeon crawling action and heroically fun quests designed for a single player or a cooperative group of 2 to 5 players. Each quest can be played in an hour or less.